The corticospinal tract is one of the several ascending afferent neural pathways which lies anteriolaterally to the ventral horn of the spinal grey matter. This pathway comprises of three neutron sets and forms part of the somatosensory system. These neurones carry information regarding pain, thermal sensation, course touch and pressure. These primary afferent neurones, also known as nociceptive neurones (read more about nociception), are specialised neurones that can be divided into 4 main modalities; mechanonociceptors (Pressure), Thermal Nociceptors, Chemically sensitive nociceptors or polymodal nociceptors. Their cell bodies reside in the dorsal root ganglion, and synapse onto second order neurones located within the posterior grey horn of the spinal cord. As previously mentioned, the spinothalamic tract is an afferent sensory pathway and has no motor function. The sensory signal that is sent from the 1st order (nociceptive neurone) depends on what nociceptive fibre was activated . Stimuli is transmitted via the thinly mylenated fast transmitting A Delta fibres. These nociceptors respond to pressure and tissue damaging stimuli. Stimuli is carried via the unmylenated, slow conduction C fibres and are activated when temperature exceeds 45 degrees. Like thermal nociceptors, the stimuli is transmitted via the slow conducting C-Fibres. These are activated in response to aligns, pH and irritants. These are the most abundant nociceptor and respond to thermal, mechanical and chemical stimuli. information is also carried via the slow conducting C-fibres. The spinothalamic tract can be comprised anywhere along the length of its ascension to the cortex. Periperheral neuropathy, seen as symmetrical damage to peripheral nerves is relatively common and is usually a result of either toxic, metabolic, inflammatory or infectious causes. Most commonly this is seen in patients with diabetes. Initially symptoms in this case is commonly sensory loss and those nerves which are longest, particularly those that transmit stimuli from the lower limb are affected first later producing the 'stocking-glove' distribution. Whilst vibration sense is usually the first to be affected, pin-prick, temperature and light-touch soon follow. Commonly as a result of disk herniation onto a nerve root, the patient will commonly complain of pins and needles and there will only be slight sensory loss due to the vast overlapping nature of the dermatomes. Sensory loss will usually follow a dermatomal pattern, reflecting the segmental level at which the herniation is occurring. Both sensory and motor impairments are witness in spinal cord injuries as a result of an insult on both ascending and descending tracts. Sensation is usually affected below the point at which the spinal cord has been damaged. In spinal cord injury patients, the ASIA scale is commonly used to diagnosed the severity. 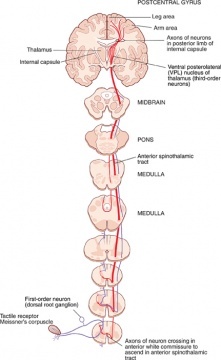 Damage to the spinothalamic tract within the spinal cord, as seen in Brown Squared syndrome, results in contralateral loss of pain and temperature whilst vibration and proprioception, transmitted via the dorsal columns, will be affected ipsilaterally. Cortical lesions, particularly if they have occurred within the parietal lobe, may affect stereognosis and graphesthesia with minimal deficits in pain, temperature and light touch perception. However this will vary on the size of the lesion. Although further information regarding chronic pain can be read here, it is worth noting that the cell origin within the dorsal horn of the spinal cord receives both inhibitory and excitatory synapses from neurones that lie within the substantia gelatinosa which is important in regulating the pain experience. There is a large evidence base that highlights the link between psychosocial factors (anxiety, depression) that increases the patients experience of pain. The integrity of the spinothalamic tract should be assessed along with other spinal tracts within a neurological assessment. A detailed subjective examination will be required, allowing the patient to describe any sensory deficits they are currently experiencing. When these tests are being performed, the patient should have their eyes closed with comparisons of the left and right side taking place. Pain: Can be examined using neurotips or safety pin, assessing various aspects of the limb comparing left and right. These objects have both a sharp and blunt end, and asking whether the patient is experiencing either sharp or dull pain allows the clinician an insight of their ability to discriminate between the two. Temperature: Can be examined by using two tubes; one with warm water and one with cold. Testing various aspects of the limb and comparing left to right, can they differentiate between hot and cold? Crude Touch: Using cotton wool / a piece of paper towel touch various parts of their extremities again comparing left to right. Ask whether or not the can feel you touching them and if so can they tell you where you are touching them? Sensory re-education with various different stimuli to help try to reinforce the sensory pathways that have been damaged. ↑ 1.0 1.1 Tortora, G.J. and Derrickson, B. (2011). Principles of Anatomy and Physiology. 13th Edition. John Wiley and Sons Inc.
↑ Crossman, A.R. and Neary, D. (2015). Neuroanatomy an Illustrated Colour Text. 5th Edition. Churchill Livingstone. ↑ Mtui, E., Gruener, G. and Dockery, P. (2016). Fitzgeralds Clinical Neuroanatomy and Neuroscience. 7th Edition. Elsevier. Philadelphia, USA.